Apple Inc. designs, manufactures, and markets mobile communication and media devices, personal computers, and portable digital music players worldwide. The company also sells related software, services, accessories, networking solutions, and third-party digital content and applications. It offers iPhone, a line of smartphones that comprise a phone, music player, and Internet device; iPad, a line of multi-purpose tablets; Mac, a line of desktop and portable personal computers; and iPod, a line of portable digital music and media players, such as iPod touch, iPod nano, and iPod shuffle. The company also provides iTunes app and the iTunes Store; Mac App Store that allows customers to discover, download, and install Mac applications; iCloud, a cloud service; Apple Pay for making mobile payments; Apple TV, a portfolio of consumer and professional software applications; iOS and OS X operating systems software; iLife, a consumer-oriented digital lifestyle software application suite; iWork, an integrated productivity suite designed to help users create, present, and publish documents, presentations, and spreadsheets; and other application software, including Final Cut Pro, Logic Pro X, and its FileMaker Pro database software. In addition, it offers various Apple-branded and third-party Mac-compatible and iOS-compatible accessories, including headphones, cases, displays, storage devices, and various other connectivity and computing products and supplies. The company sells and delivers digital content and applications through the iTunes Store, App Store, iBooks Store, and Mac App Store; and sells its products through its retail stores, online stores, and direct sales force, as well as through third-party cellular network carriers, wholesalers, retailers, and value-added resellers. It serves consumers, and small and mid-sized businesses, as well as education, enterprise, and government customers. The company was founded in 1977 and is headquartered in in Cupertino, California. Long-term trend has been tested and bounced off yesterday after a doji candlestick which could confirm a reversal of the current short-term downtrend. Support seats at 106, 104 and 103-100 which should be a strong one. Resistance at 115 and 120. 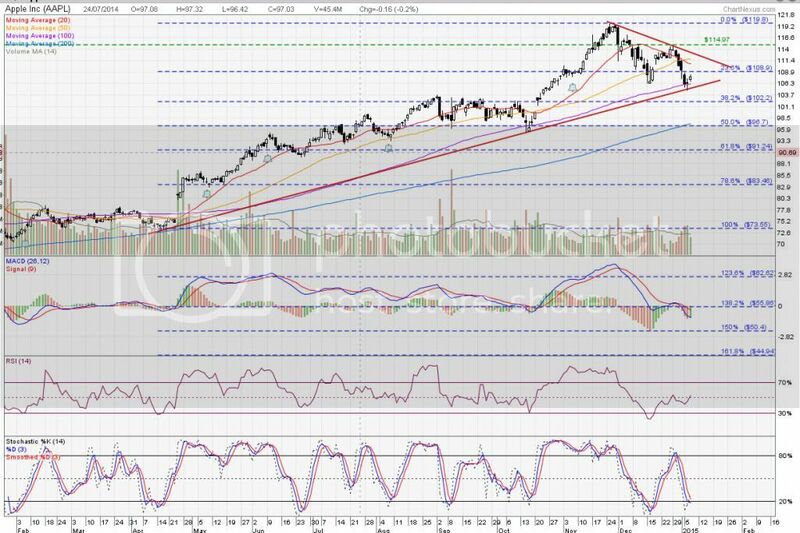 MACD is still on a bearish level while MACDO (oscillator) gave a buying signal. With the news going around about a new thinner and lighter Macbook Air with retina display, will AAPL stock price go up with the hype? Im a USA stock and option traders. Among all the stocks I trade, I feel AAPL is one good blue chip to hold for mid to long term. Apple Music will succeed, not just because of all the extra features, such as the DJ radio station, the library from itunes..
but because it would be pre-installed in all new iphones, and in the new iOS. 100m subscribers... $1.2billion revenue a year. I thought that it is not a good sign for Apple to offer the iPhone annual upgrade programme. To me, it is a clue that the market is now saturated and that it is going after people who can't outright afford to buy an iPhone each year.